This is the 2nd time that I've notified you folks about blocked ports. They meaning Zenimax Online or Bethesda states it is my ISP or Internet Service provider or router thats doing this. I'm going to try & see if I can post what they sent me so that YOU folks can check out what is going on. I need help with this issue!! Thank you for contacting The Elder Scrolls Online Team. My name is Kelton, and it is my pleasure to assist you today. I have investigated into this for you, and I have added the Murkmire DLC to your account due to you being such a consistent, and avid player. I wanted to let you know that we do care about our players, and try to do the best by them, when possible. If you would contact your ISP with the above information, they can help you resolve your connection issues. When opening outbound ports, each router is different, so the best way to get support for your router is to refer to your router manufacturer or your internet service provider (ISP). Because of this, we recommend you look to your ISP or router manufacturer for assistance. I hope what I have done is able to help you, even only a little right now, but we will be able to get to the bottom of this if the above steps do not work. Thank you for your continued interest and support! Don't give me too much credit. When it comes to the Panoramic gateways, its difficult to work without a proper manual. 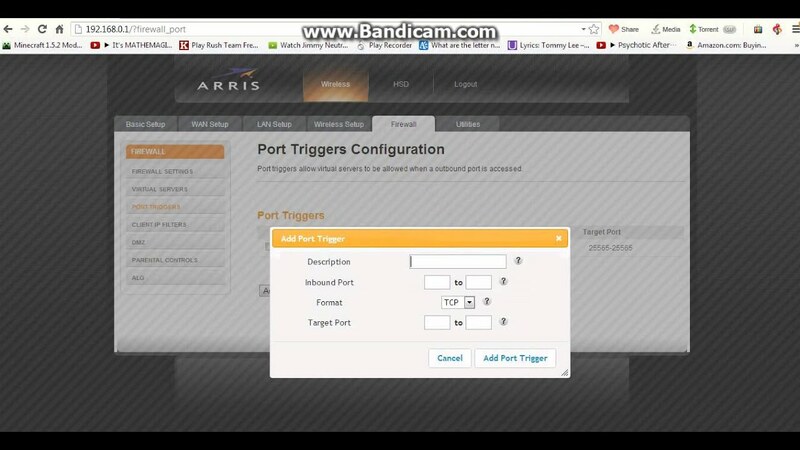 I found the image below which shows atleast where Port Triggering is. ok this is on the Arris page so I'll go on there in a minute. But what are you to enter in as far as a description?? Is that just made up by me??? They also have boxes for "Inbound Port" and then "Target port" What's the difference ?? Does both boxes have to be filled out??? In other words can I leave the target port boxes blank and just use the Inbound ports??? Description doesn't matter. Inbound port and target port are the same. Format is both. However looks like you solved it on your own. Good job. Actually I didn't :( !! I was able to open the ports as instructed. I followed the instructions to the letter. However, when doing a port checker they will not open even after launching the game. I even disabled the router firewall & still to no avail. I also unplugged the router for about 10 min & then rechecked it again but nope I'm kinda afraid to reset to factory settings .......but that would be the only thing left to try. Did you have a antivirus program or any kind of software firewall? Also, can you show a screenshot of the port triggering rules? Last, do you have a cell phone you try tethering to your PC to rule out ISP issues. It's possible one of those ports is used by the gateway for remote support or some other kind of application. If not, the other alternative would be to try bridging the gateway into modem only mode and see if that works.